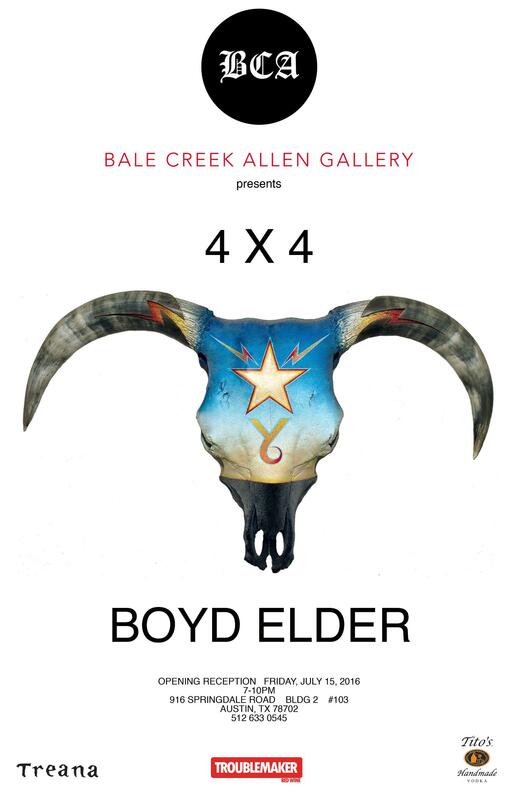 Legendary Texas multi-media artlaw Boyd Elder mounts a rare exhibition of his original “American Fetish” painted and adorned animal skull art at the Bale Creek Allen Gallery in Austin, Texas, opening on Friday, July 15. Elder is scheduled to attend the opening reception that evening starting at 7. 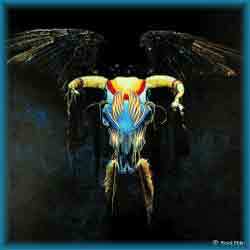 Titled “4×4,” the exhibit features four major works – Elder’s original skulls that Eagles used for the band’s multi-million-selling “One of These Nights” and “Their Greatest Hits” albums in 1975 and 1976, plus two rare editions of the Grammy-nominated Eagles album cover art previously unseen by the public. Born in El Paso, Texas, in 1944, Elder has described himself as an artistic child, “cursed with the blessing” of a vivid imagination. He earned accolades and awards for his early multi-media works and journeyed to the West Coast in 1963 with scholarships to study at the Chouinard Institute, now part of the California Institute of the Arts in Valencia, California. Eagles’ ‘One of These Nights,’ Boyd Elder, 1975. 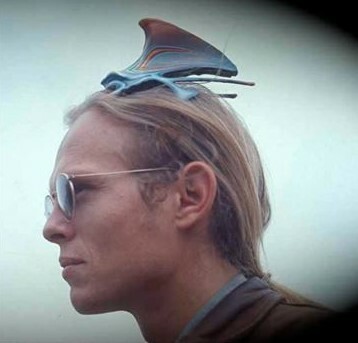 On the way to earning a BFA there in 1968, Elder studied with Phil Lieder and Robert Graham (a Chouinard co-founder), and earned the respect of peers on the exploding 1960s California art and rock scene. Since those years, Elder has split his time between Texas, California and Hawaii, experimenting with new art mediums and displaying his latest works at the occasional special exhibit. His works range from the American Fetish pieces to experiments with plastics and resins, and with holographic foil and aluminum. They’ve been exhibited nationally for more than five decades, and Elder art has been collected by some of the contemporary art world’s most diverse and reputable collectors. Elder is a longtime resident of the tiny West Texas town of Valentine, population about 175, located 40 miles south of Van Horn and 400 miles due west of Austin. Eagles’ ‘Their Greatest Hits,’ Boyd Elder, 1976. Valentine’s a little more than a wide spot on two-lane U.S. Highway 90, but Elder’s roots there are deep. His grandfather laid out the town for settlement two generations ago. Elder the younger’s studio fills an abandoned ‘30s-vintage gas station on the highway, which parallels the Union Pacific railroad tracks that run through town on the way to points east and west. 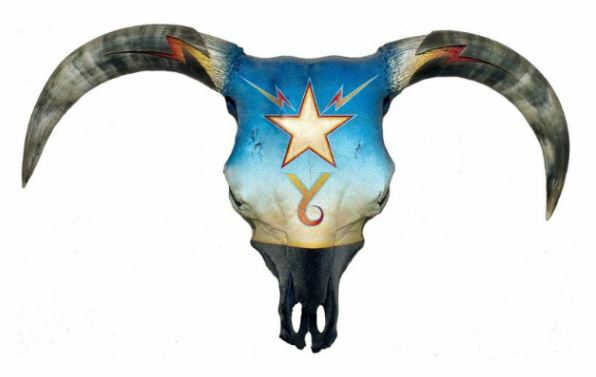 He’s a loner and eccentric, very much a product of his uncrowded West Texas upbringing, but nonetheless gifted (or cursed) with a modern artistic vision and a relentlessly restless creative spirit. Elder was inspired to create the “American Fetish” series by a gift from close friend and fellow Texas artist Rick Griffin in 1972. Griffin painted and adorned a Thanksgiving turkey breast and mailed it to Elder (pictured on Elder’s head, below right; photo by Griffin’s partner Randy Nauert). Elder expanded on the concept, adding Native American and Texan-Southwest motifs. 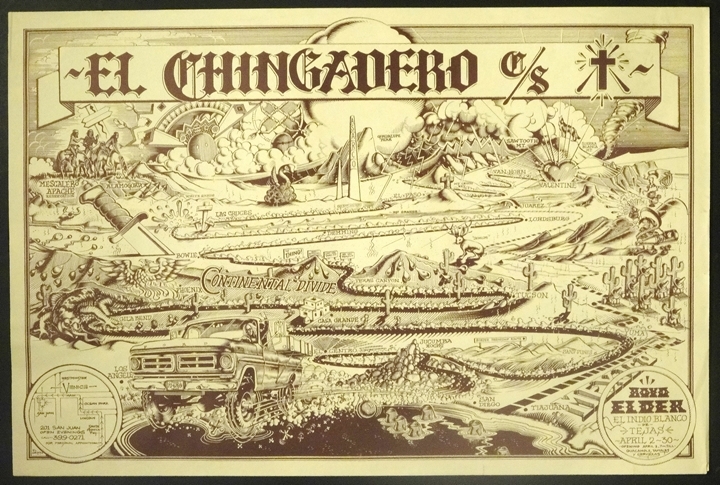 He first unveiled his “American Fetish” in April 1973, at his legendary “Chingadero Show,” an exhibition at a Venice, California art gallery. Attending the opening party were early Elder supporters and collectors Jackson Browne, Joni Mitchell, “Mama” Cass Elliot, David Geffen, Ned Doheny, Woodstock/Monterey Pop photographer Henry Diltz, and Glenn Frey, Don Henley, Randy Meisner and Bernie Leadon members of the brand-new rock group Eagles. 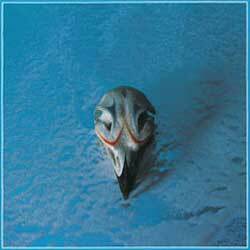 Frey and Henley thought Elder’s art perfectly projected their band’s image, and eventually secured the rights to use the art for the two covers, the fourth and fifth Eagles albums released by Asylum Records. Eagles’ “One of These Nights” earned a Grammy nomination for package designer and Elder friend Gary Burden, and quadruple-platinum status for initial sales of more than four million copies in the United States in 1975-76, according to the Recording Industry Association of America. 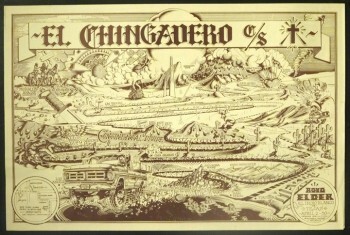 “El Chingadero” poster by Rick Griffin, courtesy Boyd Elder. The band’s “Their Greatest Hits” went on to become the U.S.’s biggest-selling album of the 20th century, and the second-best-selling album ever (after Michael Jackson’s “Thriller”), at more than 29 million copies, per the RIAA. While most don’t know the artist’s name, music fans around the world immediately recognize Elder’s iconic images as the Eagles covers. In recent years Elder has become a major figure in the growth of the contemporary art community in Marfa, Texas, about 25 miles south of Valentine on U.S. 90. Boyd Elder looks north from Valentine along U.S. 90, April 22, 2015. Photo: Stephen K. Peeples. He’s also earned international notoriety as the official representative of the Prada art installation on the highway a few miles north of Valentine. 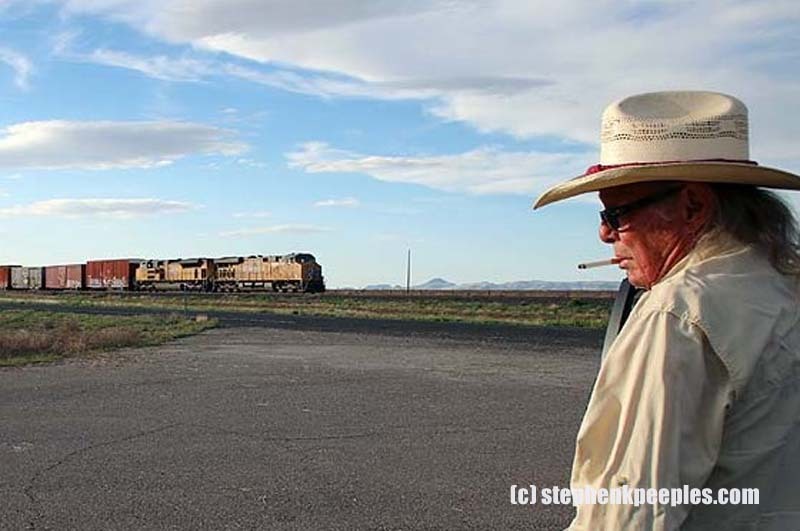 Elder has been subject of numerous media profiles in outlets over the years, including NPR, Rocky Mountain Musical Express and Texas Highways. His celebrated work will be on view at the Bale Creek Allen Gallery and open to the public Friday, July 15 through Sunday, August 28, 2016. The gallery is located at 916 Springdale Road, Building 2, #103, Austin, Texas, 78702. Phone is 512-633-0545. For more information about the exhibit, visit the gallery’s Facebook page. Ed. Note: This is an expanded version of the press release Stephen K. Peeples wrote for the Bale Creek Allen Gallery.